We are beyond happy with the work you and your crew did for us. I really couldn’t envision what the granite steps would look like before they were done but I absolutely did not think they would look this good. My wife keeps sending pictures to family and we had a few friends over who complimented the work right away. Over the last few years Natural Path Landscaping has been increasing the number of permeable paving projects each year. Yes, we had projects where the layout prevented us from draining the water away from the house so permeable paving became the obvious solution. However, since there were so many other advantages, with no disadvantages, we finally made the decision for almost all our projects to use permeable paving. This year we had 32 permeable paving projects and only 5 non-permeable projects. Most of our permeable paving projects even use a paver with such a small joint (see pictures) that most people do not even realize that the pavement is permeable. We have also realized that permeable paving, in most cases, does not require any more excavation than non- permeable paving. The dual fact that permeable paving recharges the ground water and does not have rainwater runoff from the paved surface makes permeable paving very desirable. However, there are other less obvious advantages. First, the occasional settling of non-permeable paving due to ants and chipmunks is eliminated. This year we were approached to resolve a situation in which small ants had come in under an edge restraint and removed the 1” thick bedding layer of sand under a 5-year old paver patio resulting in settling of the border pavers. How these small ants removed the sand and where they took it remains a mystery but we know that ants cannot tunnel in or remove crushed stone. Similarly, chipmunks cannot burrow in crushed stone since it cannot support a tunnel. The crushed stone aspect of permeable paving resolved the situation. Second, with permeable paving there is no expansion or movement during freeze/thaw cycles in winter months since the crushed stone cannot hold water. Third, the elimination of moisture below concrete pavers all but eliminates efflorescence which is a white, mineral powder deposit on the paver surface due to moisture wicking out of the paver. Permeable paving extends to natural stone, as shown in these bluestone walkways. 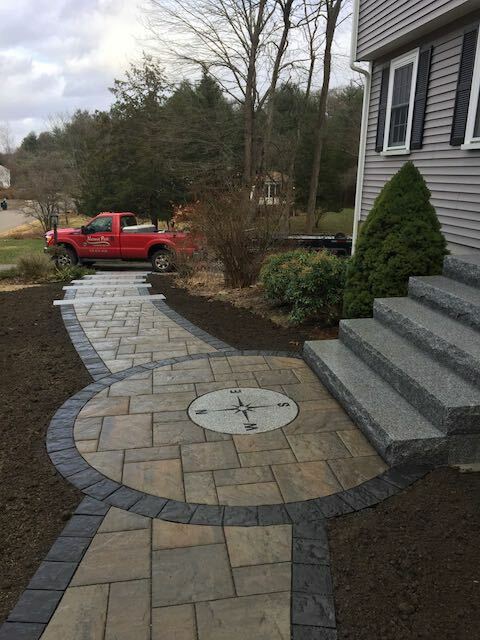 These walkways feature full color, thermal bluestone and are built on a 7” thick base of crushed stone with a smaller crushed stone in the bluestone joints. Permeable paving is especially useful for preventing settling or movement of retaining walls around raised patios. In this case, the crushed stone is over 2’ deep in the far corner of the patio and required very little compaction because of the lack of ‘fines’ (stone dust) in the crushed stone. This patio uses the same full color, thermal bluestone. Notice how the bluestone surface extends directly over the wall to create a ‘vanishing edge’. These walkways and patios are examples of traditional designs made permeable using traditional concrete pavers set on a 7” thick crushed stone base. Construction during the wet and sometimes very cold conditions in November and December was not a problem because we did not use polymeric sand or base materials and sand that freeze up. This driveway is built on very wet land with a high water table. Before construction, there was considerable frost heaving near the house. Our solution was to install a 1,920 square foot permeable paver courtyard area close to the house and then repave the remaining 255 foot long driveway with asphalt. These courtyard pavers are installed on an 18” thick layer of crushed stone that contains 4” diameter PVC tubes to remove excess water from the crushed stone water reservoir beneath the pavers. The tubes are set 10” above the bottom of the excavation so only the excess water is removed when the water table gets too high. This site was having lots of rain water runoff and erosion. Our solution was to terrace the area by adding a wall with steps. We used Goshen stone for the wall, steps and walkway paving to achieve the rustic charm desired by the homeowners and set everything on a permeable, crushed stone base. 1-1/2” rounded stone was used to fill the joints between the Goshen stones.